As is our custom on these trips, we 'splurged' on our final hotel by using points to stay in the Lima Sheraton, where we didn't have to worry about 3 important things: good water pressure, availability of hot water, and having a comfy bed. As is custom for these nice hotels we stay in, we got a little bit of the evil eye as we rolled into the marble lobby straight off the overnight bus, but they found a room for us fairly quickly and we cleaned up and headed out for the 'trendy' district of Miraflores, a section of Lima that runs right up against the Pacific Ocean. It reminded us of a combination of Santa Monica + Miami, with striking cliffs atop of which were perched a bunch of condominiums, shopping malls, and restaurants (why is there a Tony Roma's in Lima Peru?). It was significantly more clean and nice compared to some of the other places we have been on our trip, which in a way made it a little uncomfortably strange. In the evening we strolled through central Lima, through a few plazas filled with people and a pedestrian shopping/eating area. We settled into a restaurant that had a bunch of people in it and dined on another new item, skewers of grilled cow heart (antichucho). It wasn't all that bad and tasted more or less like any other beef we've eaten before. It was a Tuesday night and while we looked long and hard for any sign of nightlife, we didn't find anything great so we just called it a night - we knew we had a long day ahead of us the next day as our flight to LAX did not depart until 2AM. On our last day of the trip, we did most of the central Lima sights, the highlight of which was the Church of San Francisco which included a library straight out of Indiana Jones, with books that were over 300 years old! It was really interesting but unfortunately no photos or videos are allowed inside. An added bonus to our final day was the crazy celebration taking place in the streets of Lima, it was some kind of religious festival having to do with Miracles, but nonetheless it was really busy on the streets, a few of which were closed to traffic, and there were food carts all over selling various tasty treats. 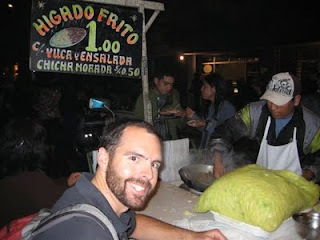 When it came time for dinner, we were ready to hit up a pena, which in Peru and Bolivia refers to a place with live music or other entertainment as well as dinner; unfortunately the one Pena in walking distance to our hotel was closed for a private party. Lucky for us, the street party was still going on so we decided to do a food cart crawl. Given that in a couple hours we were to board a plane for a long flight home, this was a pretty risky call, but we crossed our fingers that our stomachs could take it. We wandered the streets and stopped at each and every cart that caught our eye. We ended up spending about 6 Soles for dinner for both of us, which is a little less than $2 USD! We had some tasty fried meat (which upon googling the name we now realize to be calf liver), some kind of fried potato with unknown items inside, some quasi-Asian noodles, a chicken sandwich, and a few dessert-like items...all in all an adventurous meal that we probably would not have had at the pena. Around midnight we decided to call it a trip and head for the airport. The flight home was fairly uneventful, both of us slept pretty much the whole way to LAX and then hopped over to the domestic terminal to standby for the earlier flight to SFO, which was delayed of course, but still had seats for us. We made it home around 1PM, had some lunch, and then immediately started re-packing - we were due back at SFO the next day at 8AM to fly out to Indianapolis, where we had planned to visit for Halloween and the 49ers - Colts football game...and thus our whirlwind 2 weeks in Bolivia & Peru came to an end. I think attending the religous festival of Miracles saved your butts after all that cart food!! Lucky for your fellow passengers too! Enjoyed your blog.